Pipet filler for all pipets from 0.05 to 100 mL. One-piece, natural red rubber pipet filler is equipped with an automatic valve that is removable for easy cleaning. 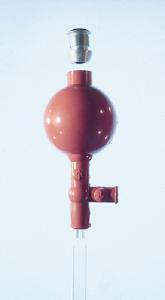 The automatic blowout valve eliminates the need for two hands to evacuate the bulb. Press the “up” arrow to intake liquid; press the “down” arrow on the arm to empty. Press below the “up” arrow to release the pipet.